The SBE 21 accurately determines sea surface temperature and conductivity from underway vessels. Data is simultaneously stored in memory and transmitted to a computer serial port, allowing independent data logging and real-time data acquisition. Typically mounted near the ship's seawater intake, the SBE 21 is connected to an AC-powered interface box positioned near the computer. The interface box provides power and an isolated data interface, and contains a NMEA 0183 port for appending navigation information to the data stream. For corrosion resistance, only plastic, titanium, and the glass/platinum cell are exposed to seawater. 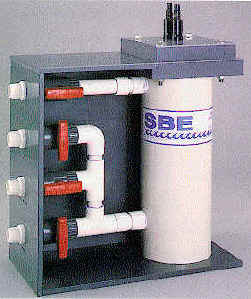 Valves control seawater circulation and fresh water flushing. The sensor assembly is easily removed for cleaning and calibration.